Here is the latest block I made for Sew Bee Wonky. Janeth asked for this specific block and we could arrange the colors any way we wanted as long as those four black squares stayed put. This was a challenge for me as I'm still not the best at matching points. With that being said, I was pretty darn proud of myself! I can't wait to see how this comes together. This bee has really stretched me in my confidence in using solids vs prints and colors that I wouldn't normally pick on my own. I'm up as a Queen Bee in August and I'm putting something together with scraps. I'll post it soon. Very striking with those dark colors. Being "Queen Bee" sounds like fun. Can't wait to see what pattern you work up. This page contains a single entry from the blog posted on July 29, 2011 10:53 AM. The previous post in this blog was IKEA. 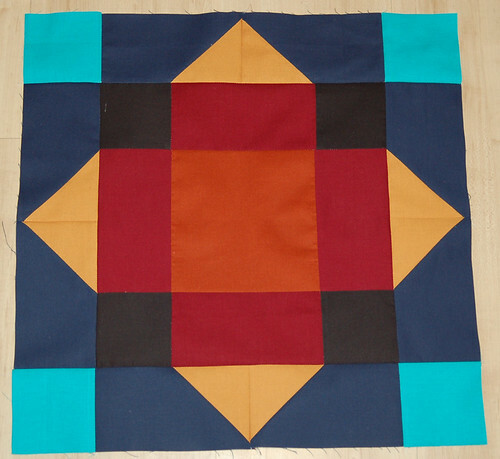 The next post in this blog is Confetti Quilt Hints and Tips.